India has launched its first satellites to be used for helping mapmakers and amateur radio operators. The Cartosat, weighing 1.5 tonnes, will supply data that will enable maps precise enough to detail every house in the country. The Hamsat, weighing about 42.5kg, will help expand bandwidth to help amateur radio operators around the world. India hopes Thursday's launch will help the country break into the lucrative commercial satellite launch market. 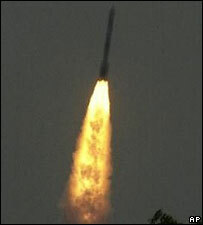 The satellites were sent into space on a locally-made rocket from Sriharikota island in southern Andhra Pradesh state. "The launch took place exactly on schedule," S Krishnamurthy, a spokesman for the state-run Indian Space Research Organisation (Isro) said, the AFP news agency reports. The launch was attended by Indian President APJ Kalam, a scientist himself who was once involved with India's satellite programme. Amateur radio operators have greeted the Hamsat as it will provide very high radio frequencies to expand ham operators. The satellite is "India's contribution" to Ham radio operators all over the world for the services after the tsunami in December, Mr Krishnamurthy told the BBC. Amateur radio operators in India have been active since 1950s but face stiff government restrictions. Until last year, they were banned from functioning in India's Andaman and Nicobar islands by the defence ministry. The government lifted the restrictions barely a fortnight before December's tsunami, which hit the islands badly. Two Indian operators who landed in the islands after the ban was lifted eventually played a major role in getting relief across to the affected people in the islands. The bigger Cartosat satellite is expected to supply high resolution pictures for making precise maps which would be used in planning towns and disaster assessment, among other things. Last September, India launched a satellite to be used for expanding the country's educational network. In September 2002, India successfully launched its first weather satellite to help the country predict cyclones and storms more accurately. In 2001, it successfully tested its first geostationary launch vehicle, which is capable of launching bigger satellites into a higher orbit. India also plans to send a spacecraft to the moon by 2008. 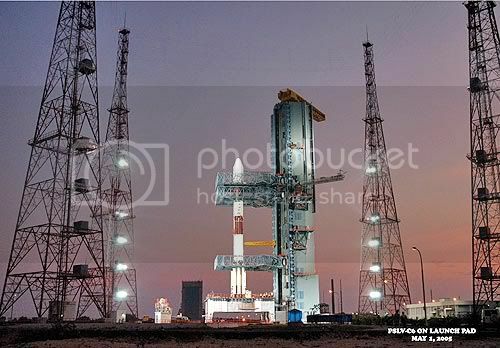 PSLV Coming out of the Vehicle Assembly Building ............. The launch vehicle is integrated inside a this building. On it's way to the launch Tower on Mobile Launch Pedestal. Is this the first satellites launched ever by India? I'll post a couple articles from a special feature NewScientist.com did on the Indian Space Program. These articles do very well to explain the history, aims, successes and future of the Indian Space Program and the Indian Space Resarch Organization (ISRO). NESTLED amid the eucalyptus, cashew and coconut trees of Sriharikota Island on the eastern coast of India, north of Chennai, is a 76-metre steel tower. If all goes to plan, some time in late 2007 the tower will be engulfed in flames as India's first mission to the moon blasts off. Sriharikota will also be the launch site for India's most advanced scientific research satellite, Astrosat. The satellite will measure, among other things, X-ray radiation emitted by matter sucked into black holes and given off at the birth and collision of stars. But why is India, a country that still has so many development problems on the ground, aiming for the heavens? To Indian scientists, the question is not only patronising of their scientific aspirations, it betrays an ignorance of the Indian space programme's greater purpose and successes against the odds. India's political leaders say the country cannot afford not to have a space programme. Indira Gandhi, who was India's longest-serving prime minister, believed it was not only important for science, but also vital to India's development. Take, for example, India's six remote-sensing satellites - the largest such constellation in the world. These monitor the country's land and coastal waters so that scientists can advise rural communities on the location of aquifers and where to find watercourses, suggest to fishermen when to set sail for the best catch, and warn coastal communities of imminent storms (see "Eyes in the sky"). India's seven communication satellites, the biggest civilian system in the Asia-Pacific region, now reach some of the remotest corners of the country, providing television coverage to 90 per cent of the population. The system is also being used to extend remote healthcare services and education to the rural poor. In the long run this has given India an advantage over other countries with aspirations to reach space. Its space programme is already largely self-sufficient and aims to soon be completely independent of foreign support. One of the GSLV's rocket boosters is a Russian-made cryogenic engine. International sanctions meant India was only allowed to buy engines, not the know-how to design and build them. So for future rockets ISRO engineers are developing their own. Ground tests have been completed and the plan is to launch a completely home-made GSLV-Mark 2 by the end of this year, Nair says. ISRO is already planning the next-generation GSLV, the Mark 3, which will be powerful enough to launch India's biggest satellites. Nair now has his sights on the commercial market. A launch on GSLV-Mark 3 should cost about half the rate charged by France, the US and Russia, he says. India's space programme is already a money-earner. ISRO sells infrared images from its remote-sensing satellites to other countries, including the US, where they are used for mapping. And the Technology Experiment Satellite, launched in October 2001, is beaming back images of the Earth's surface with a resolution of 1 metre, though they are not yet available commercially. Three per cent of ISRO's $3.3 billion 5-year budget is devoted to the planned moon mission. 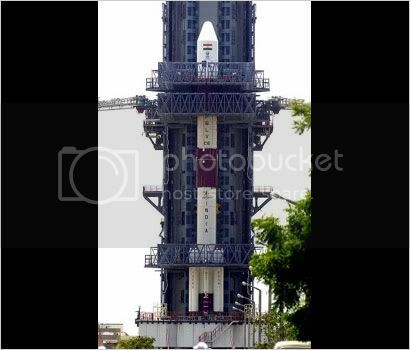 A reconfigured PSLV rocket will lift Chandrayan - "moon vehicle" in Hindi - to 36,000 kilometres, after which the craft's own engines will take it to the moon. Chandrayan will create 3D maps of the moon's surface at a resolution of between 5 and 10 metres, something that has never been done before. It will also map the distribution of ilmenite, a mineral that traps helium-3, a possible source of energy for future bases on the moon. According to Nair, the Madras School of Economics in Chennai has estimated that ISRO's projects have added between two and three times the organisation's budget to the nation's GDP. Several countries in Africa and Asia are seeking ISRO's help to emulate the model. "India is perhaps the only country where societal needs are met by the space programme in a cost-effective manner and the services are reaching the needy," says Nair. THOUGH Astrosat and the moon mission are the headline-grabbers, using imaging satellites for development remains at the top of the agenda for the Indian Space Research Organisation (ISRO). For instance, when the skies are relatively clear between January and March, infrared images are used to measure the reflectance of plant-covered surfaces to check how well watered the crops are. "We are able to forecast the yield one month before the harvest," says Venkatakrishna Jayaraman, the director of ISRO's Earth Observation System. In this way the government can be forewarned of possible food shortages. Ensuring a supply of clean drinking water is a problem in many parts of rural India. Villagers often resort to guessing the right spot to drill a well based on experience, but it is a hit-and-miss affair. Topographic and hydrological maps produced from satellite images allow Jayaraman's team to help rural communities locate areas most likely to yield underground water. "The success rate for drilling wells has gone up from 45 to 90 per cent," says Jayaraman. Besides remote sensing, ISRO operates eight communications satellites. These are now used by 35,000 commercial customers, all based in India. "If we didn't have the satellites, they would have gone and hired a satellite from somewhere else," says Appana Bhaskarnarayana, director of ISRO's satellite communications programme. ISRO has also used these satellites to implement disaster-warning systems. In 1977 a cyclone killed 10,000 people on the coast of Andhra Pradesh in south-east India. In the 1990s data from meteorological satellites was used to warn of a similarly devastating cyclone, dramatically reducing the loss of life to 900. "The technology has helped to predict cyclones maybe a few hours in advance," says Bhaskarnarayana. "Lots of lives have been saved." ISRO is becoming more ambitious in how it plans to use these satellites. It has already linked 69 hospitals in remote areas of India such as the Andaman Islands to 19 hospitals in India's main cities. A health worker in a remote location can then transmit a patient's medical information to a specialist in seconds and, in many cases, a video consultation is sufficient for diagnosis. This means the patient can avoid travelling huge distances unless it is absolutely necessary. "I'M IN love with this," says Subramaniam Ananthakrishnan, sweeping his arm over a rural landscape dominated by giant dishes. The radio astronomer has reason to be besotted. He and his colleagues spent 15 years transforming this once desolate region of Khodad, 90 kilometres from Pune in western India, into a home for the Giant Metrewave Radio Telescope (GMRT) - the world's largest, low-frequency radio telescope and India's biggest basic science project. This is Big Science on anyone's scale. The telescope consists of 30 antennas, each one 45 metres across. Twelve of them sit in a 1-kilometre-square central region, while the remaining 18 stretch out along three arms, each 14 kilometres long. The central cluster allows the telescope to pick up extremely faint signals, and the arms give it high resolution. India is a good spot for this world-class facility. The country has a long tradition of radio astronomy and, compared with many rich nations, its airwaves are relatively uncluttered. Through clever innovation, such as using a mesh of fine wires to form the reflecting surface of each dish, Ananthakrishnan and his colleagues, led by NCRA's Govind Swarup, have created a revolutionary, low-cost design. The entire telescope cost $12 million. One of the GMRT's main tasks is investigating the clouds of hydrogen gas thought to be the precursors of galaxies. Its biggest asset is its ability to detect a 1420-megahertz radio signal emitted by excited hydrogen gas. In distant galaxies, which are moving swiftly away from us because the universe is expanding, this "spectral line" is shifted to a lower frequency by the Doppler effect. The shifted frequency is well within the telescope's range, allowing astronomers to use it as a probe for studying the dynamics of evolving galaxies. Today, radio astronomers around the world are planning the next-generation radio telescope, which they are calling the Square Kilometre Array. "Everyone is looking at GMRT as a test area for the SKA," says NCRA astrophysicist Pramesh Rao. Radio astronomer Paulo Freire of Cornell University in Ithaca, New York, agrees: "The beauty of GMRT's design is deeply influencing the construction of the SKA." Nice stuff. Think India might land on the moon next? India has been launching Sctellites for various Countries Including Germany , Italy , Belgium ........ the list goes on . It was just this first sentence that I wasn't too sure about..
"India has launched its first satellites to be used for helping mapmakers and amateur radio operators"
An Indian rocket blasted off Thursday, carrying the country's ambitions to be a major global space power and two satellites that it launched into orbit. The liftoff in southeastern India marked the first time India has launched a rocket with two satellites aboard and notched up another achievement in its ambitious space programme to send a probe to the moon by 2007 or 2008. " IF you look closely you will get a Impression that this is a first time India has launched Two satellites from one Roket.......... Actually what they mean this is the first time India launched Two Indian made satellites ...... ......... and almost all the time it was more than 2 ......... one Indian and other of Foreign origin .......... you gotta earn Money as well don't ya ......... But this is the First time time PSLV blasetd off with 2 Indian made satellites .